In the latest release notes, I saw that Qemu can now run OS X! Sure the colours are off, and it is kind of pokey, but still the more guest OS’s on Qemu, namely for something like the PowerPC. 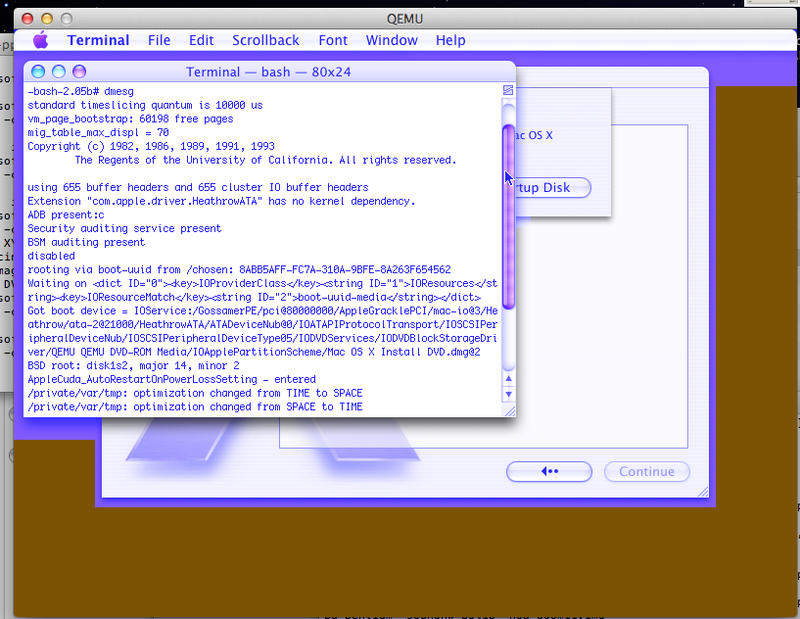 If anyone has any better idea of how to fully run OS X on Qemu drop me a note! Plus there is additional information on the mailing list. For OS X 10.4 to work, you should launch QEMU with -M mac99 in order to emulate newer hardware. The incorrect colours are interesting, as they indicate the framebuffer is inverted (i.e. BGR instead of RGB) because of a missing endian swap between host/guest framebuffers. Do you see the incorrect colours all the way from boot, including OpenBIOS and the Apple logo? Or is it only once the OS has booted? Also does using SDL instead of VNC make a difference? I’m not sure on the framebuffer as I have no idea what it should look like. On OS X, it is always yellow with black text, the apple logo on boot is grey on a yellow background… maybe it is all backwards on OS X’s UI as it is expecting the older PowerPC host? I don’t know but the x86/x64 stuff displays correctly…. FWIW. I haven’t tried the SDL framebuffer, but I can give it a shot. What ethernet adapter (if any) is supported? What about sound? Ah okay I just noticed that you were using -M g3beige in your command line above which I’m fairly sure isn’t supported above 10.2. Possibly experiment with/without the -cpu option to see if that makes a difference? I know Alex reported his initial success with 10.4. Sound – I’m not sure about that, but for NICs then since Macs have a PCI bus then I guess you can just dig out drivers for the standard cards provided by QEMU if they are not detected by the OS automatically? The OpenBIOS background should be a light yellow colour while the Apple Logo is grey on grey, so if you don’t see those colours on boot then something is wrong 🙂 Double-check config.log to make sure you’re using the internal pixman just to be sure. Also just to clarify – the colours look okay with a x86/x64 host but not on your G5 PPC host? It could be that the problem only occurs on same-endian host/guest combination. which is the equivalent of setting that NVRAM option in Open Firmware. Sorry to be “that” guy, but do you have a binary I might try? I can package something up later on… I need to build myself a virgin VM to make sure I got all the library dependancies in order. I’ve thrown together the x86 emulator, which is available here. The PowerPC stuff is here. Don’t know if qemu supports OS9, but if you can somehow get XPostFacto running to “kickstart” the installer boot process, it can likely be used as a workaround to get 10.4 running. It manages to disable all those pesky “not supported” installer messages. Tiger runs fine on my G4 upgraded PM8600 and Beige G3 despite Apple saying its impossible. The colour swapping definitely looks like a framebuffer endian bug, but I suspect the reason no-one has done anything about is because it hasn’t been reported yet. Note that I myself use a x86-64 Linux host running a PPC guest images (which requires a framebuffer endian-swap) and the colours are correct for me, which may suggest it is something limited to OS X hosts rather than all x86-64 hosts. There are also different display clients that can be used, so try using all of GTK, VNC and SDL using the various command line options to see if that makes a difference too. I would suggest filing a QEMU bug report (http://wiki.qemu.org/Contribute/ReportABug) so that someone can try and reproduce the issue on your platform, as once the cause is discovered then the fix itself should be fairly minimal. maybe? I dont’ know, I haven’t tried. Have there been any news about emulation of PPC Macs since this blog post was made? I’m very happy that Previous is almost complete for NeXT machines, but the joy won’t be complete until we have a working emulator for PPC Macs. The G3, G4, and G5 Macs are machines I’d really continue using through emulation if it existed. At this point in time, all we have is Sheepshaver which is an interesting piece of software on it’s own. It basically relies on 68000 hooks in the PowerPC ROM to pull a Basilisk II, using it’s paravitualized drivers for inputs, display, sound and networking. What makes it tricky is that the jit emulator relies on having the PC’s memory space match the PowerMac’s so you need to be able to use the address 0x00000000 as memory. Sadly Windows is letting you do that with 64bit exe’s nor is the newer OS X versions. It’ll sort of run in 32bit mode, but it’s all too common for it not to be able to directly map the memory. Looking at the dynamips PowerPC jit, it may be possible with a LOT of work to get that working but I honestly just don’t see that many people interested TBH. And of course the dynamips authors have all but disappeared. PearPC is another emulator for the early OS X versions. It’s cool and all but sadly the primary author was killed in an accident. How much did you use it? I mean, do you consider it qualifies as “it’s actually running”, or do you experience too many issues to use it? BTW, is there any progress in emulating G5 PowerMacs, or is the mac99 still the only working platform -limited to G3 or G4 IIRC? Well the problem is that I have a working 1st gen G5 now, that will run 10.2.7 which is pretty damned great. Also I found a MacBook Ti for around $20 that was ‘broken’ and I thought I could try to brush up my soldering sills on it, and I ended up accidentally fixing it. So I now have a working G4 & G5, although OS X only devices. I’ve also been slowly collecting enough parts to get a B&W G3 up and running. I plan on either writing about it later, or doing a video, maybe both. The overall issue with Qemu is that it is SLOW. Sheepshaver is WAY faster, but also far more prone to crashing. If I had time/motiviation/money I’d look at the dynamips G4 emulation that seems to be pretty good (it runs Cisco IOS just fine), and adapt that to run MacOS. But I just don’t see anyone really caring to be honest. TiBook G4s can run MacOS 9, the Aluminum Powerbook G4s are the first ones that were OS X only. power5 using slof seems to be a viable g5 qemu option- but it appears to not like the Leopard install disc. Maybe because devs think power arch requires LE(little endian) and not BE(big endian)?? and yes- you can qemu ppc64 the TALON- or near the TALONII specs. Use power9 cpu and alpine linux. Root login with no password. Previous Previous post: QEMU version 1.6.0-rc3 is out!